P aeruginosa infection of the external auditory canal may be acute or may be a chronic serious infection called malignant otitis externa. Acute diffuse otitis externa is often referred to as swimmer’s ear. P aeruginosa may be part of the normal flora of the external auditory canal or may colonize the canal as a result of exposure to water. Swimming, a humid climate, and local trauma result in inflammation, desquamation, and bacterial proliferation. The clinical signs and symptoms are erythema, discharge, pain, and pruritus. An aggressive hemorrhagic form has been associated with hot tub use. Topical antibiotics, topical corticosteroids, and drying agents are usually effective therapy, although relapse is frequent. Malignant otitis externa is the contiguous spread of necrotizing P aeruginosa infection from beyond the external auditory canal to the adjacent soft tissue and bone and is a serious infection usually occurring in elderly diabetics with microvascular disease but may also occur in elderly nondiabetics, or in association with systemic corticosteroid treatment, AIDS, or rarely in infants. Irrigation of the ear with water in these patients may represent a risk factor. Infection spreads from the external auditory canal through adjacent cartilage and soft tissue to the parotid space, the temporal bone, and mastoid air cells and then to the base of the skull. Symptoms include severe pain and discharge sometimes associated with decreased hearing, but systemic symptoms are rare. On examination the external auditory canal is erythematous and edematous, and granulation tissue may be observed. The middle ear is usually spared. Ipsilateral fascial nerve palsy is a common early finding. Potential complications include parotid swelling and trismus, palsies of the 9th through 12th cranial nerves, cavernous venous thrombosis, and rarely, brain abscess or meningitis. An elevated erythrocyte sedimentation rate (ESR) in the absence of significant elevation of white blood cell count is common. For the radiologic diagnosis, magnetic resonance imaging may be more sensitive than computed tomography scans, and radionucleotide scans, such as indium-labeled white blood cell scans, are useful to detect early bone involvement. P aeruginosa is usually recovered from cultures of the external auditory canal or from debrided tissue. Antimicrobial therapy should be combined with local debridement, and in more severe cases, extensive debridement is warranted. Cure is also dependent on successful management of underlying conditions such as diabetes mellitus or reduction of corticosteroid therapy. Early diagnosis improves the outcome, and an adequate response to therapy may be assessed by documenting decreased otalgia, a decrease in erythrocyte sedimentation rate, and improved radiologic appearance. 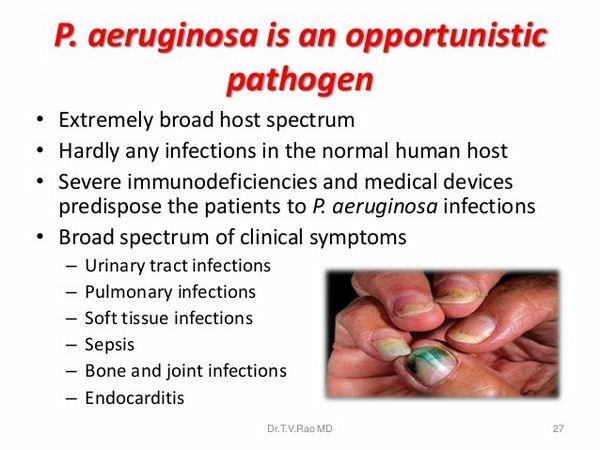 P aeruginosa is the most frequent pathogen identified in chronic suppurative otitis externa infections in all ages and is also a recognized pathogen in mastoiditis in diabetics, sinusitis in patients with AIDS, and perichondritis of the auricle following ear piercing or other traumatic procedures performed on the pinna.